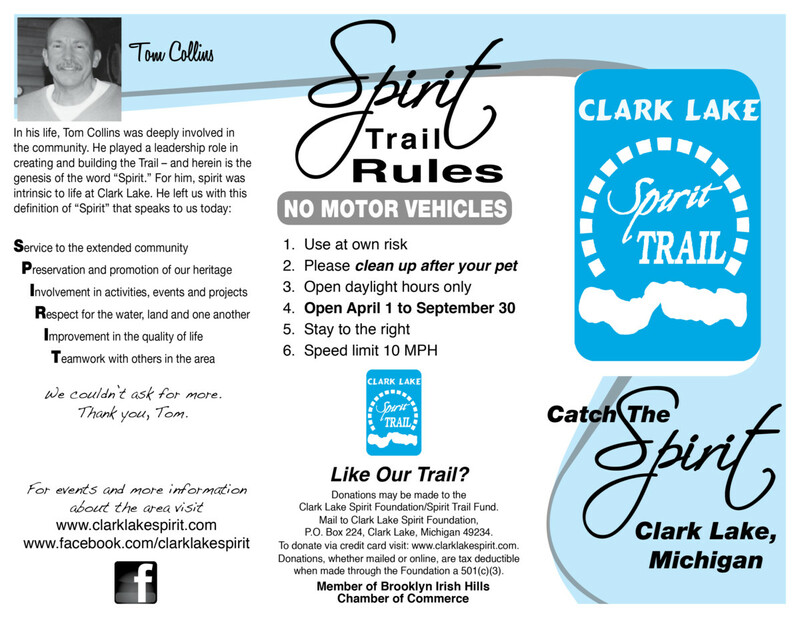 The Clark Lake Spirit Trail Committee is working on plans to enhance it. The Trail is supported entirely through private donations, and recognizing those contributions illustrates the community’s widespread support. A new wall of donors is in the plans. It will display names of new contributors and those now found on the Jefferson Road section. Names on the Jefferson Road portion of the Trail have faded, and in some cases, have entirely disappeared. The monument is proposed for the new section of the Trail between Rita and Grand Boulevard. The names will be visible from the Spirit Trail bench which faces the road. Motorists will see the other side that faces the road. Below, take a look at an artist’s mock up. (If “Clark Lake” is part of the verbiage, it will represented as two words and not contracted). The new wall has yet to be officially named. Other than the names on the Jefferson Road section, guidelines to have a name listed have not yet been been announced. The construction will likely take place in the spring. The Spirit Trail Committee meets year around and watches over the 7.3 mile path around the lake. 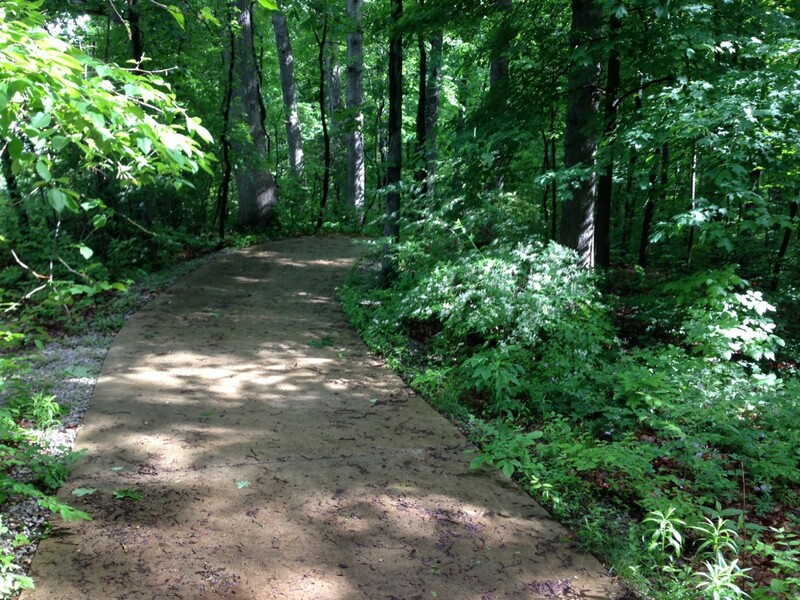 The Trail offers a variety of surfaces, and was designed with cyclists, walkers and runners in mind. Maintenance comes almost entirely from volunteers. Fund raising supports new construction like the section between Rita and Grand Boulevard and the rebuild of the area adjacent to the post office on Hyde Road. You can make a tax-advantaged donation to the Trail through this website and the Clark Lake Spirit Foundation, a 501c3. 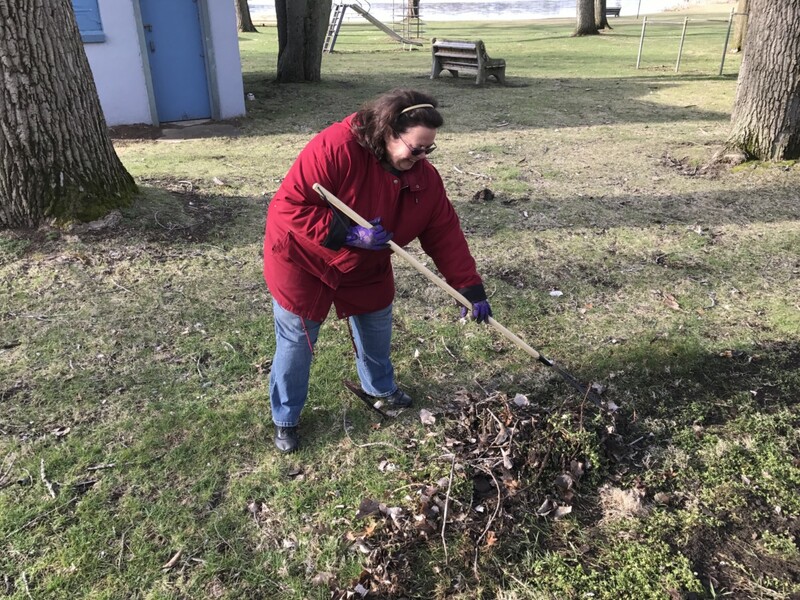 The morning was chilly, but the sun was bright as several volunteers gathered to participate in the annual Spirit Trail cleanup. In this short video, Dan Omo, project organizer, and Ann Swain, committee chairperson, tell the story. The Trail follows Clark Lake’s shoreline. Those on bikes, running or walking get a variety of views–the lake, forested areas, or traditional lake neighborhoods. The maintenance is a volunteer effort. 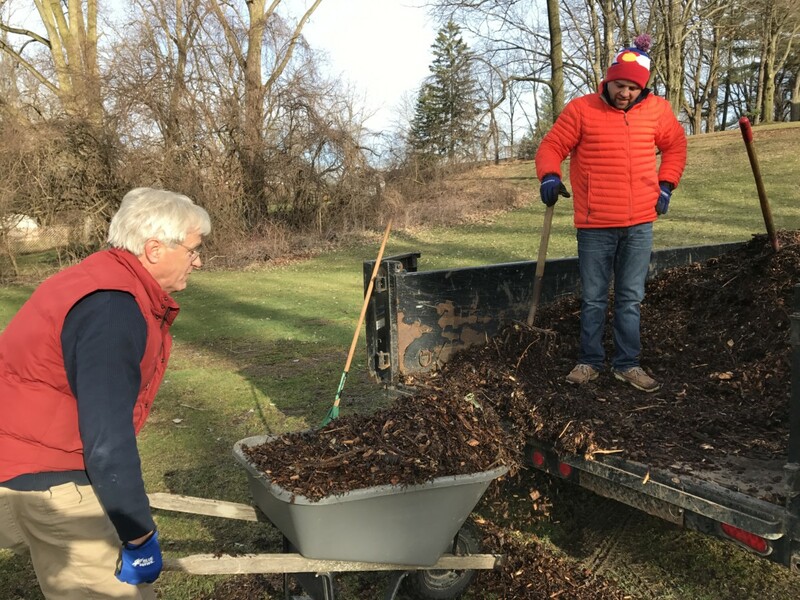 The photos below illustrate the effort of the volunteers today in three areas–the County Park, along Jefferson Road, and in the Township Park at the head-of-the-lake. Maintenance of the Trail is a continuing project. Residents clear debris, trim foliage, and manicure areas near their homes. 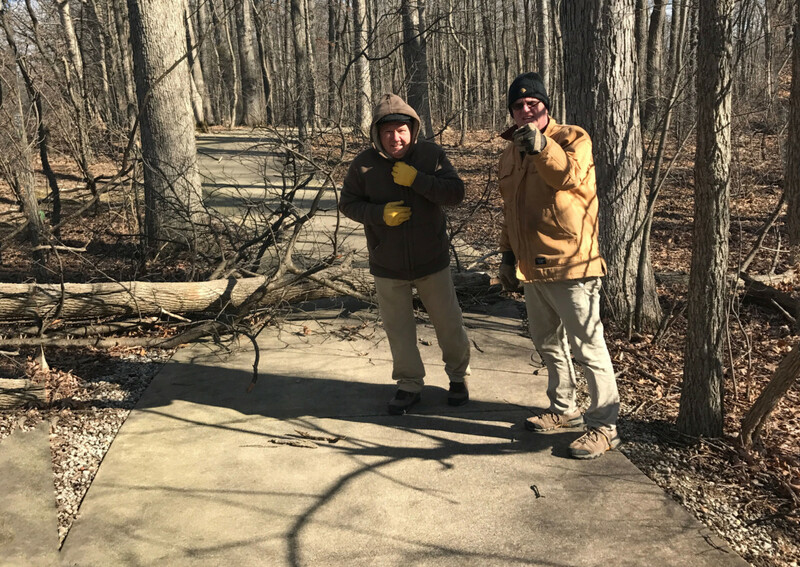 Several weeks ago, Tucker Boyers, Bob Lajdziak and Don Fowler cleared a tree that had fallen in the Magic Forest (between Jefferson Road and Lakeview East). This is truly a community project. Without widespread participation, the Trail would not exist. At times there are large infrastructure repairs or improvements. 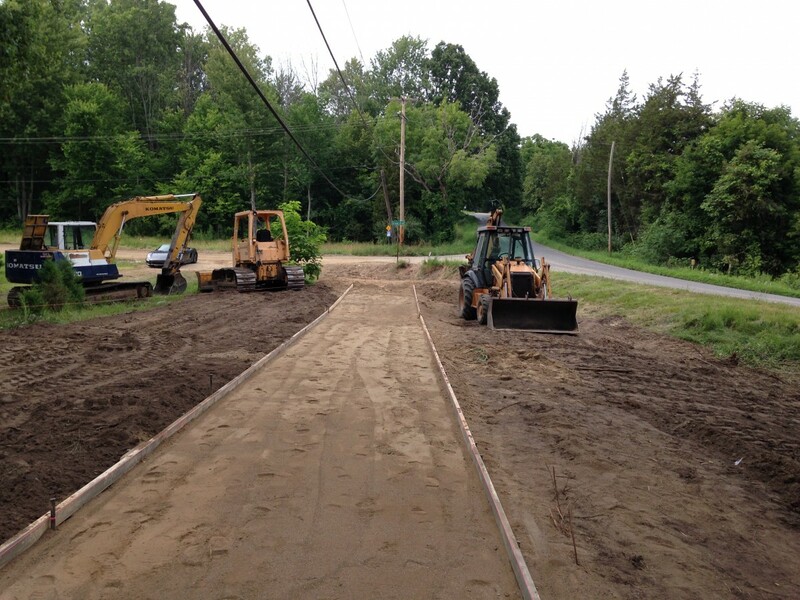 Two examples are shown below–repaving the area adjacent to the Post Office on Hyde Road and installing a new pathway between Rita and Grand Boulevard at the east end. The Clark Lake Spirit Trail Cleanup is a sure sign of spring, and it happens this Saturday, April 1st. Would you like to participate? If so, meet at the County Park at Ocean Beach at 9 am. 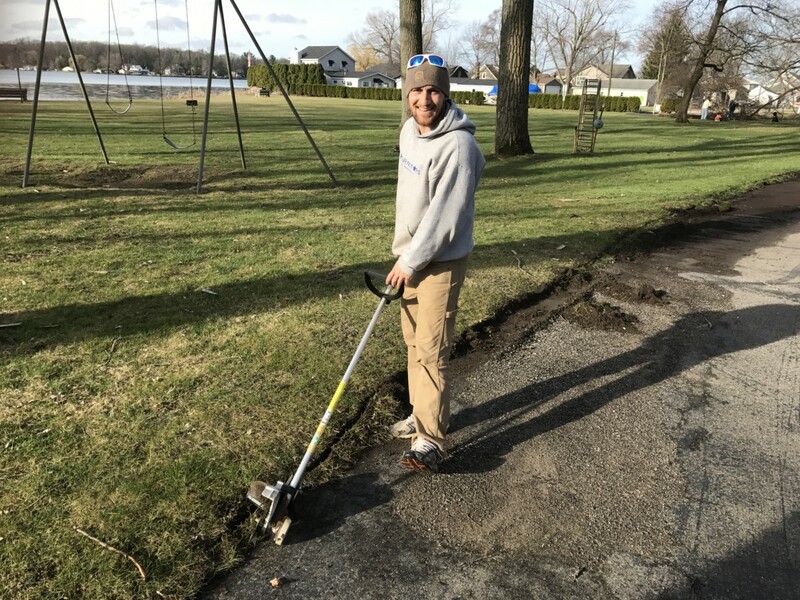 There are several locations around the lake that need attention, and Dan Omo, who is in charge of this project, can point them out to you. Coming equipped also helps. 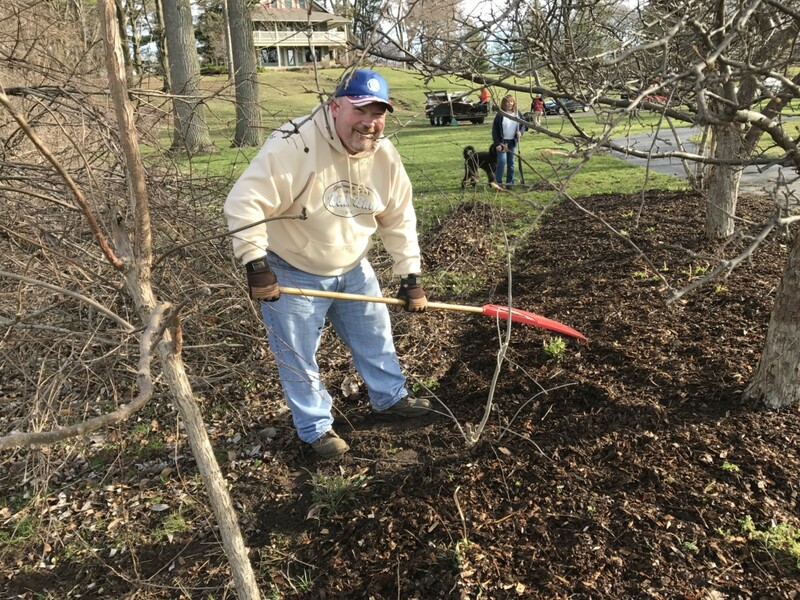 Dan suggests bringing rakes, brooms, and shovels. 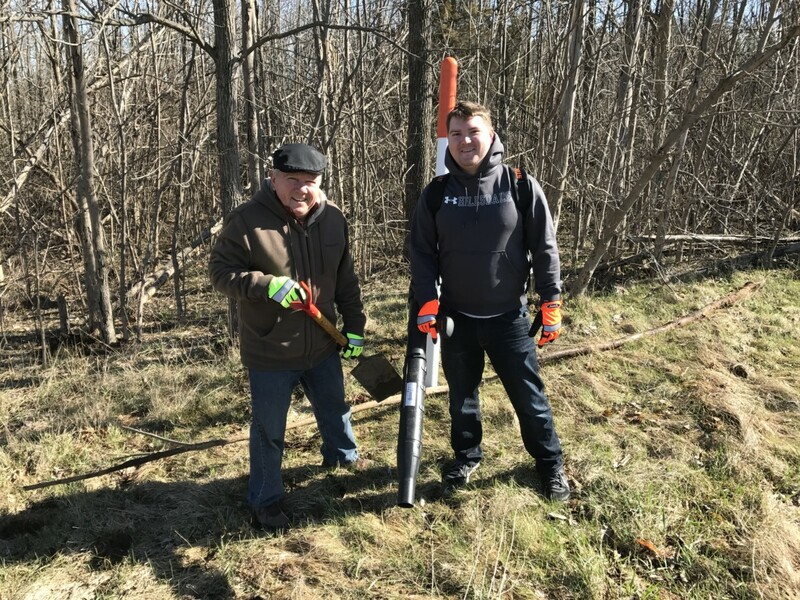 The Clark Lake Spirit Trail would not exist without volunteers. In fact, except for major infrastructure projects, it’s people like you who donate their time to keep it looking great. The Trail circles the lake, about 7.3 miles. 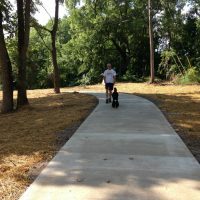 It provides a path for runners, walkers, and cyclists to enjoy multiple views of the lake, neighborhoods and nature. And it does so on a variety of surfaces. So this Saturday, it’s about clearing away what winter left behind and preparing for another great season on the Clark Spirit Trail. See you there! For Crop Walk 2016, please click here. 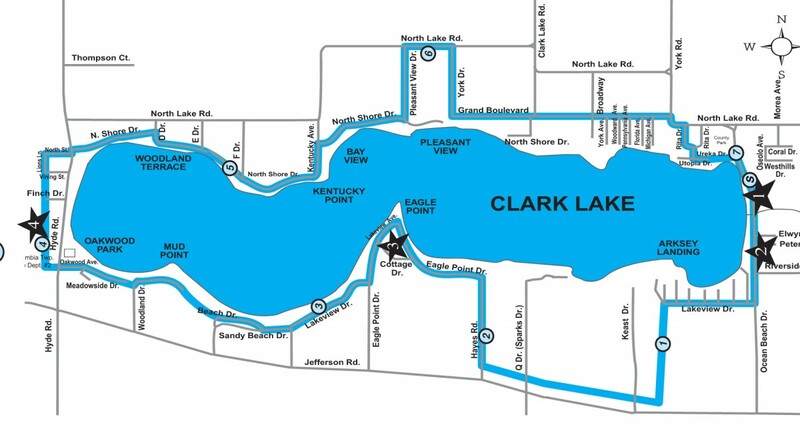 For Run Clark Lake 2016 results, please click here. 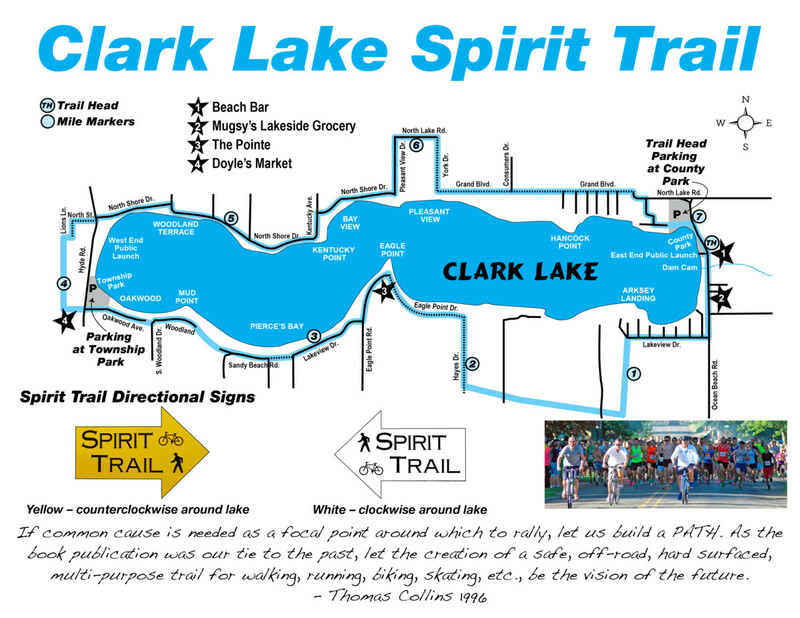 The Clark Lake Spirit Trial is used primarily by cyclists, runners, and walkers. Now there is a new activity–sitting. Three new benches have been installed along the Trail, with at least four more to come. 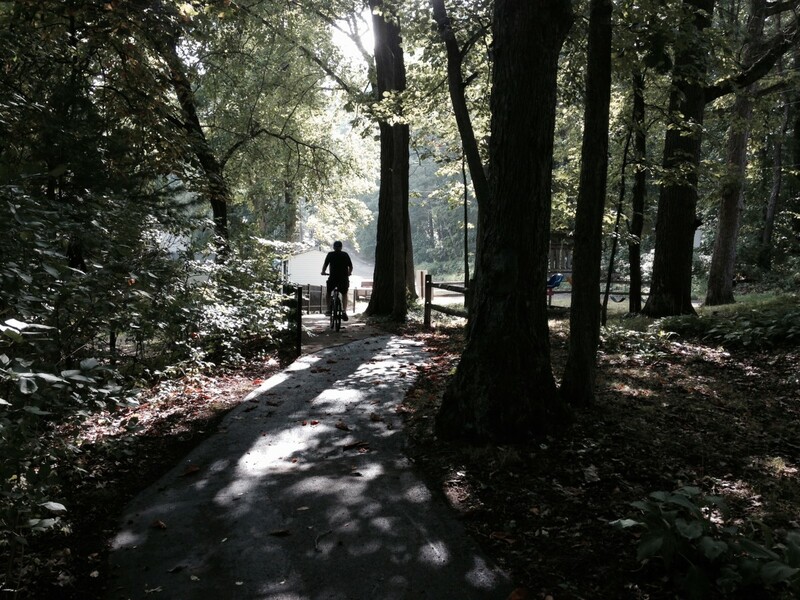 The Spirit Trail offers a variety of surroundings–lake vistas, cool forested areas, and welcoming neighborhoods. These benches will be strategically located for those who would like either rest for a while or simply contemplate the natural beauty and other environmental benefits of the lake. The new benches will typically bear the name of individuals or families. In some cases they honor the memory of someone who loved the lake. 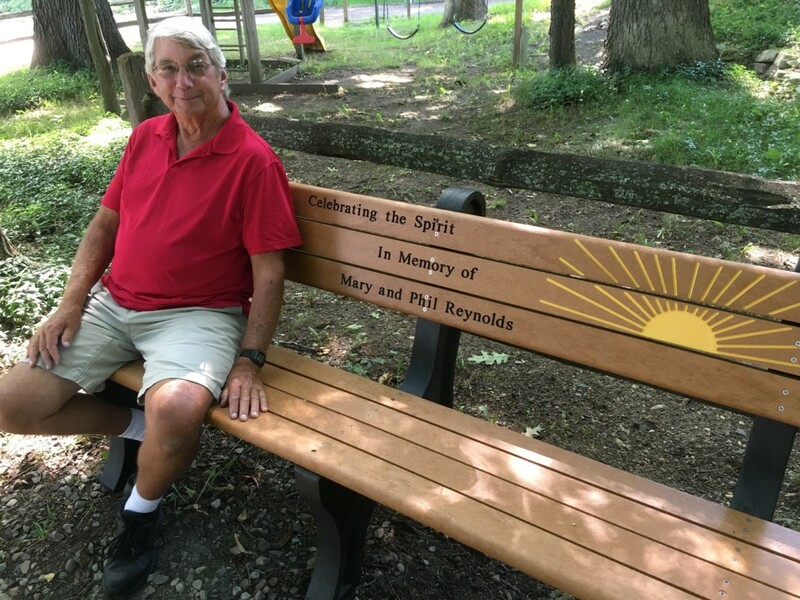 The purchase of the benches are supported by donations to the Spirit Trail. 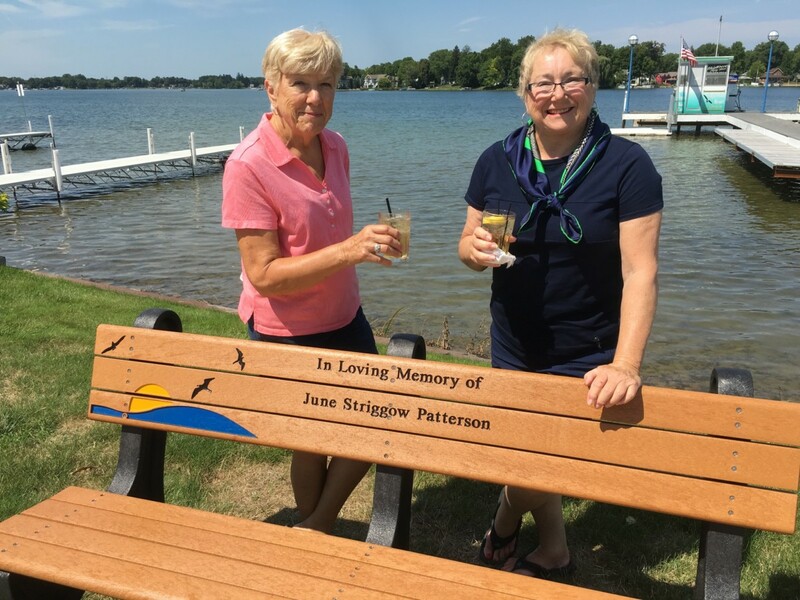 Ann Swain and Sally McCarthy at the bench honoring Sally’s mother. The two are toasting Sally’s mother with what was her favorite beverage. Currently you’ll find the benches in three locations–at Eagle Point near the gas dock, at Jefferson Road as you enter the Magic Forest, and along the cut-through between Sandy Beach and S. Woodlands. Acquiring and placing the benches is the work of the Spirit Trail Committee. Committee Chair Ann Swain with Kathleen Thorrez and Peggy Collins was joined by Flip Reynolds on the project. They investigated the options and were able to find durable benches proven to stand years of use and the demands of difficult climates. They are manufactured by Polly Products, a company located within 70 miles of Clark Lake. 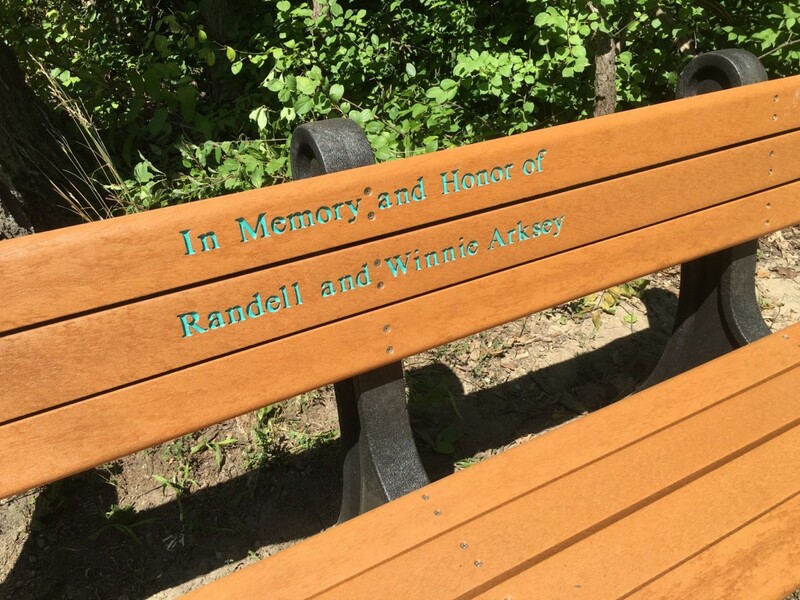 A donation of $1000 is being accepted for a bench that includes two lines of inscription. Additional lines are $86 each. For further information, please contact Ann Swain 529-9485. You can find printed copies available at the Trail Head at the County Park (east end) and at the Township Park (west end). They are also available at Doyle’s next to the Clark Lake Post Office. Or you can check it out below, and print it. The opposite side of the pamphlet (a tri-fold) offers additional information. Here it is. 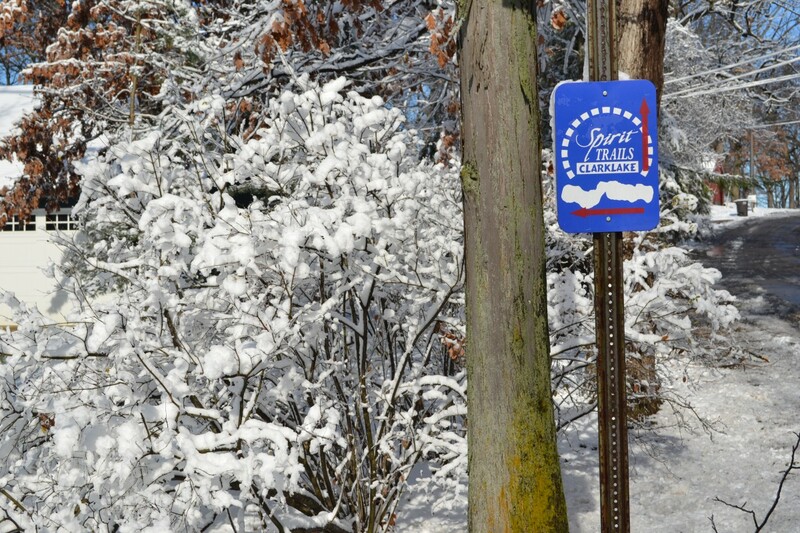 Read about the new signs to guide you on the Spirit Trail by clicking here. 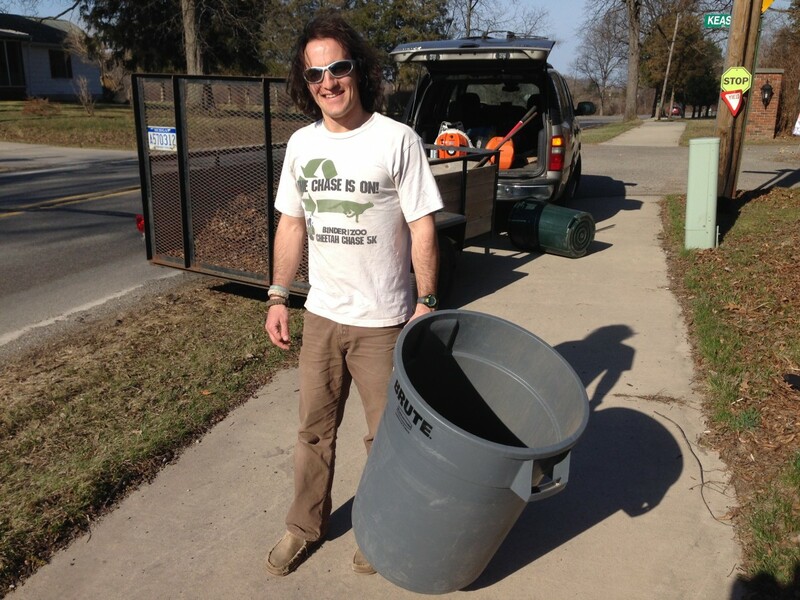 Read about the Spirit Trail Cleanup on Saturday, March 26, by clicking here. 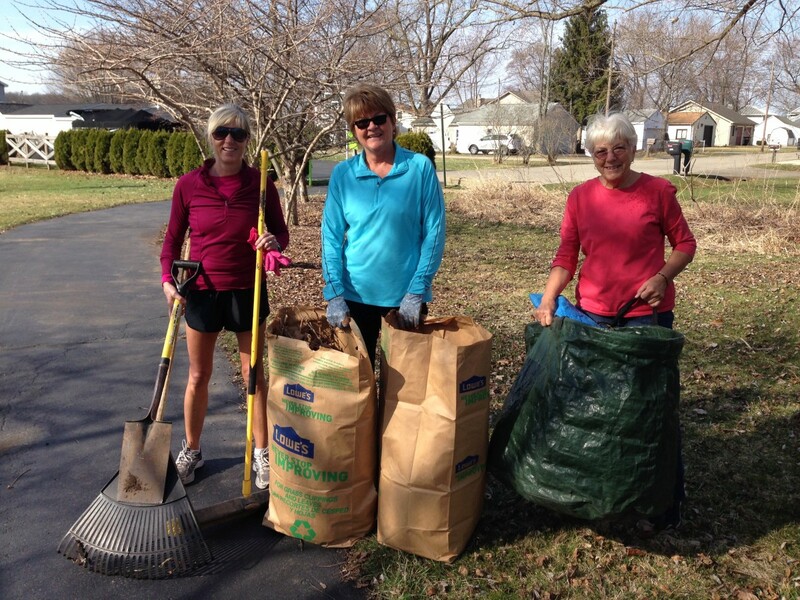 For info on the Spirit Trail Cleanup scheduled for Saturday, March 26, click here. Note: For Run Clark Lake info and sign up forms, please click here–Run Clark Lake page. 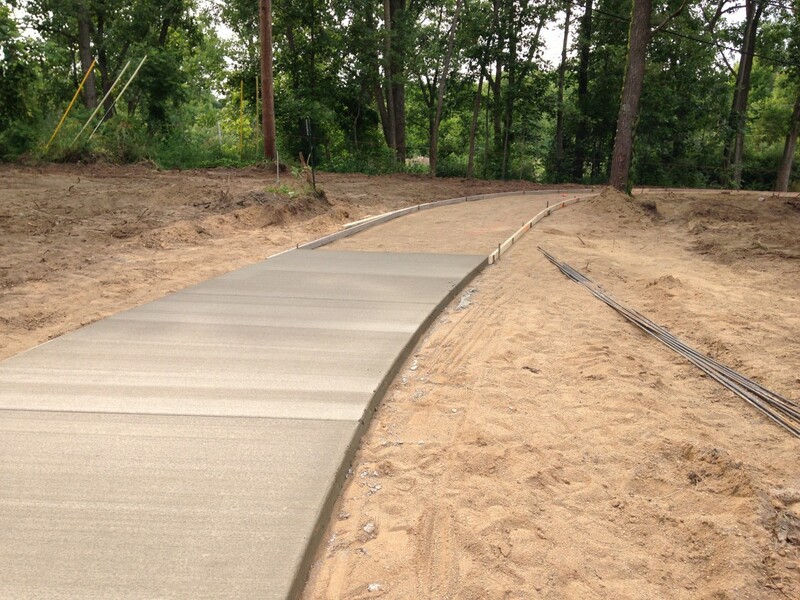 There is now new pavement in place signaling the completion of repairs to the Clark Lake Spirit Trail at the head of the lake. The section being improved is a portion of the trail that formerly was part of the old Cincinnati Northern Railroad bed. That includes the segment that turns east from the railroad bed and runs adjacent to the Post Office and extends to Hyde Road. 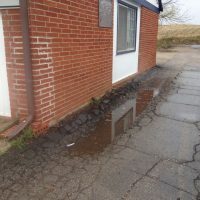 Over time, the original asphalt in that area was heavily damaged by constant freezing and thawing every winter, exacerbated by poor drainage. Post office vehicles accessing the parking lot was also a contributing factor. The Spirit Trail committee voted to repave. Once the digging began, it was clear that drains must be installed under the pavement in that area. 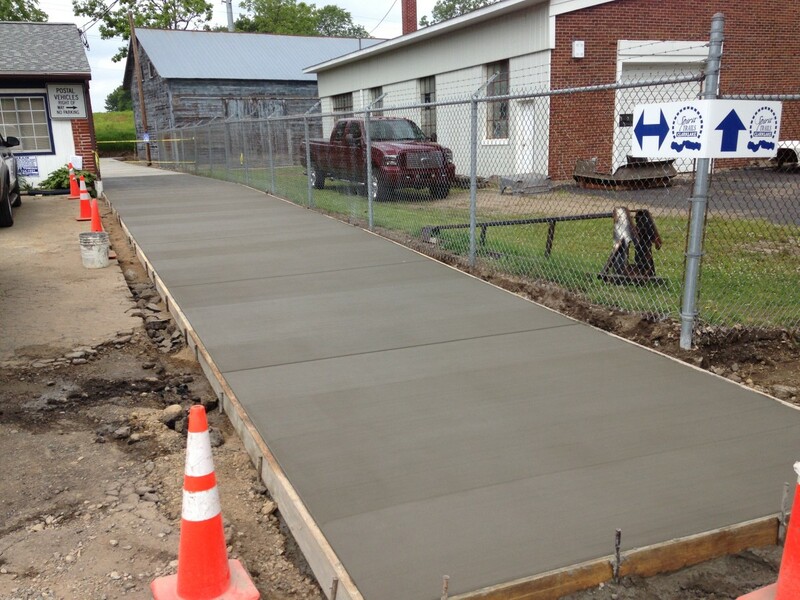 The wet soil was replaced with processed gravel and has been finished with concrete. The Clark Lake Spirit Trail is a volunteer effort. Most maintenance is done by volunteers. Construction projects are supported by fundraisers and donations from people like you. Tax free contributions can be made through the Clark Lake Spirit Foundation either by check at PO Box 224, Clarklake, MI 49234 or via credit card on this website. 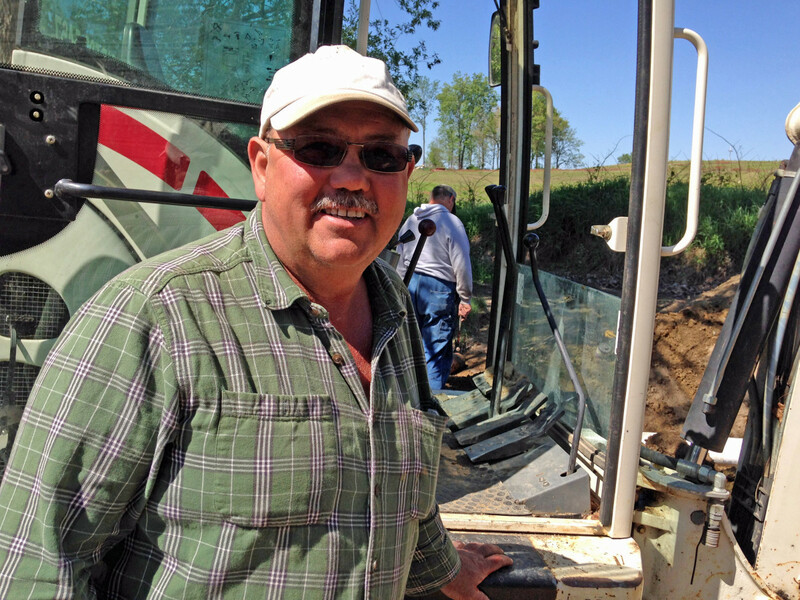 Early Friday evening found Bill Bendele behind the controls of an earth mover working on Spirit Trail repairs at the head of the lake. As previously reported on this website, the pavement was in very rough shape on the section of the Trail running from the south end of the Cincinnati Northern Railroad bed east to Hyde Road. 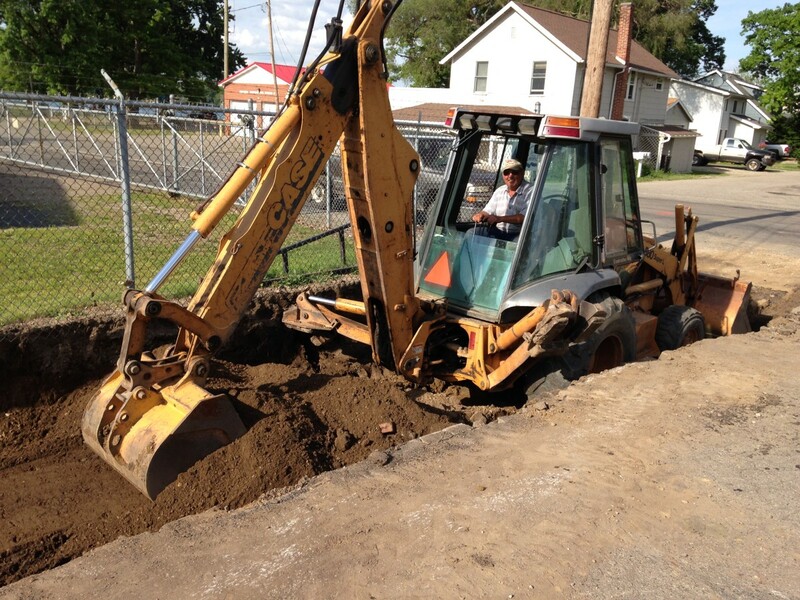 As repairs began, the digging uncovered a primary reason for the deterioration–lack of proper drainage. Put that together with repeated freezing and thawing and vehicle traffic to the rear of the Post Office and you had the recipe for an issue that would not find a cure without getting to the bottom of the problem. Some drains have already been installed, but there is still more to be done. This evening (Friday), work was continuing on the section between the front of the Post Office and Hyde Road. 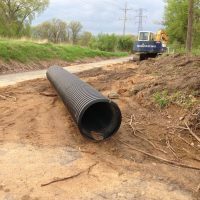 Bill Bendele, whose company is working on the project, reported that he found plenty of ground water–good reason for the installation of the drains. 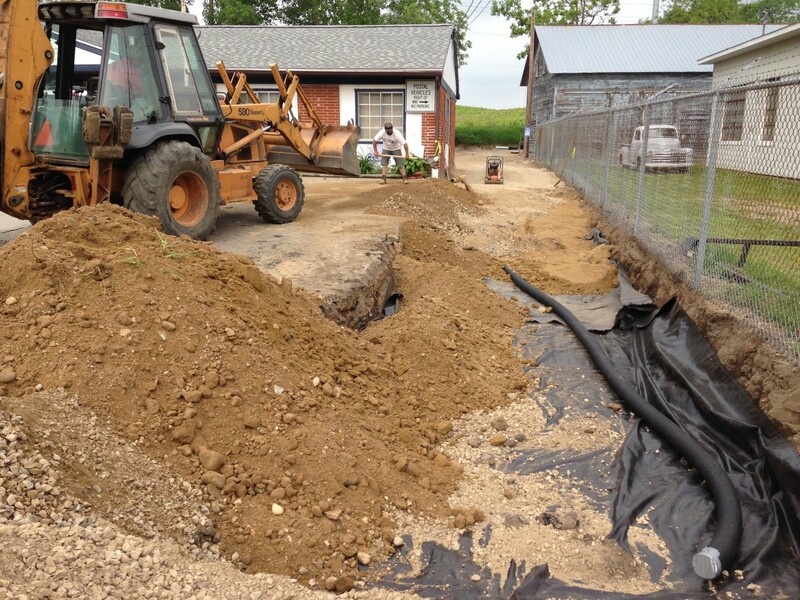 He described the repair process as “excavating the dirt, laying down processed gravel, installing the drains, and adding another layer of processed gravel. Eventually the repaired areas will be finished with concrete. The Clark Lake Spirit Trail was built and is maintained by a committee of volunteers. Financial support comes through donations and fund raising. Tax advantaged donations can be made through the Clark Lake Spirit Foundation. If you’ve been following the story on this website, you know that the Clark Lake Spirit Trail is undergoing repairs on the section that parallels Hyde Road. Particularly damaged is the area adjacent to the Post Office. Seasonal freezes and thaws plus some vehicle traffic have caused significant deterioration. 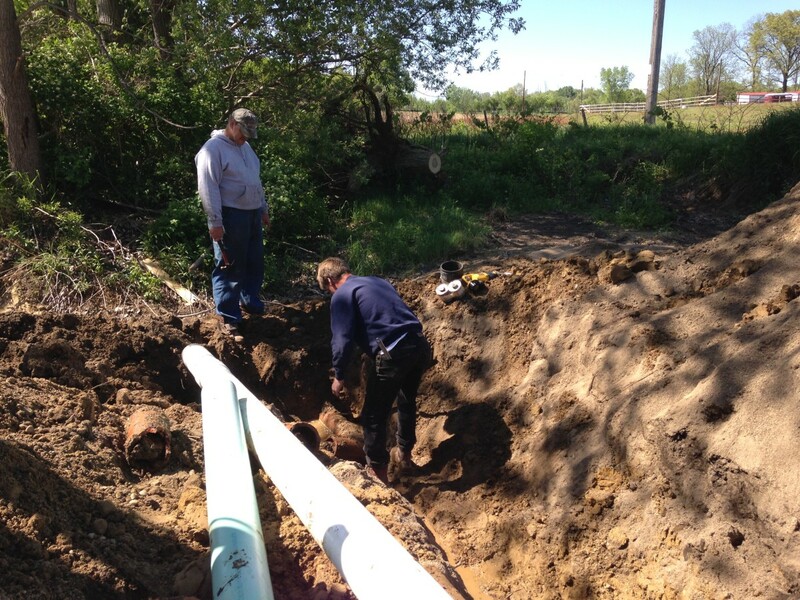 And is sometimes the case, understanding what exacerbates the problem isn’t uncovered until the digging begins. In this case, the area under the pavement was found not to be a firm foundation, but soaked with runoff. When any sort of weight was applied to the surface, the asphalt separated and only became worse. To correct the problem, it’s necessary to run drainage under from where the Trail meets Hyde Road, along side the Post Office building and rear parking area and finally to the area where the Trail heads north on the old Cincinnati Northern Railroad right of way. 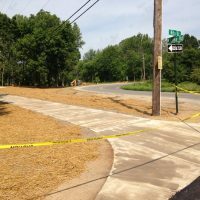 Once the drainage system has been installed, it’s expected that new pavement will extend from the edge of Hyde Road to the old railroad bed. The Clark Lake Spirit Trail is far from a “once and done” venture. 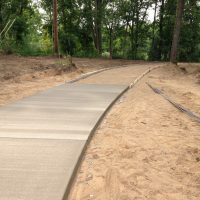 Regular maintenance, improvements and repairs (like that described in this story) are required to keep the Trail in good order. Only through people like you does support take place. Would you like to help? Your donation is tax advantaged through the Clark Lake Spirit Foundation–via credit card on this website or by mailing a check to PO Box 224, Clarklake, MI 49234. Dan Omo, last year, working on the Trail clean up. 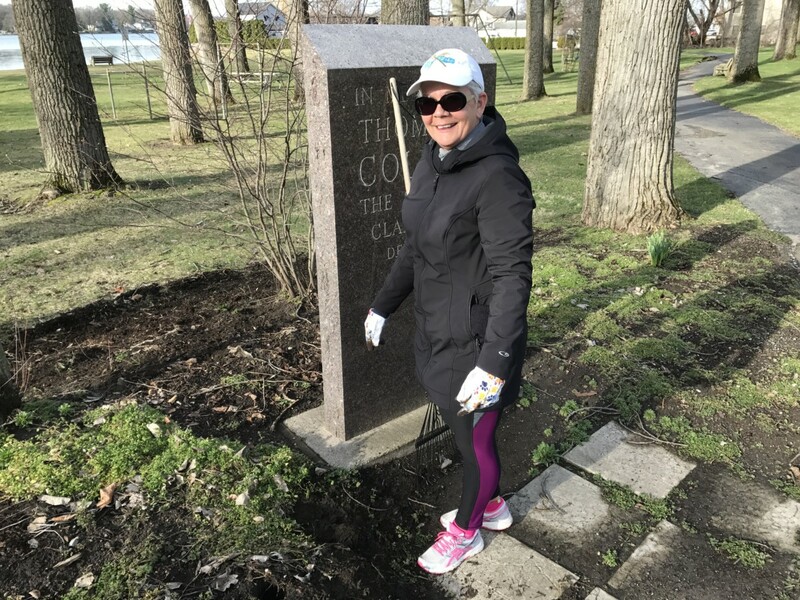 Here’s a reminder that the Spirit Trail spring clean up takes place tomorrow morning (Saturday, March 21). You can join others who believe in the benefits of the Trail in this annual effort at 9 am at the County Park at the east end of the lake. 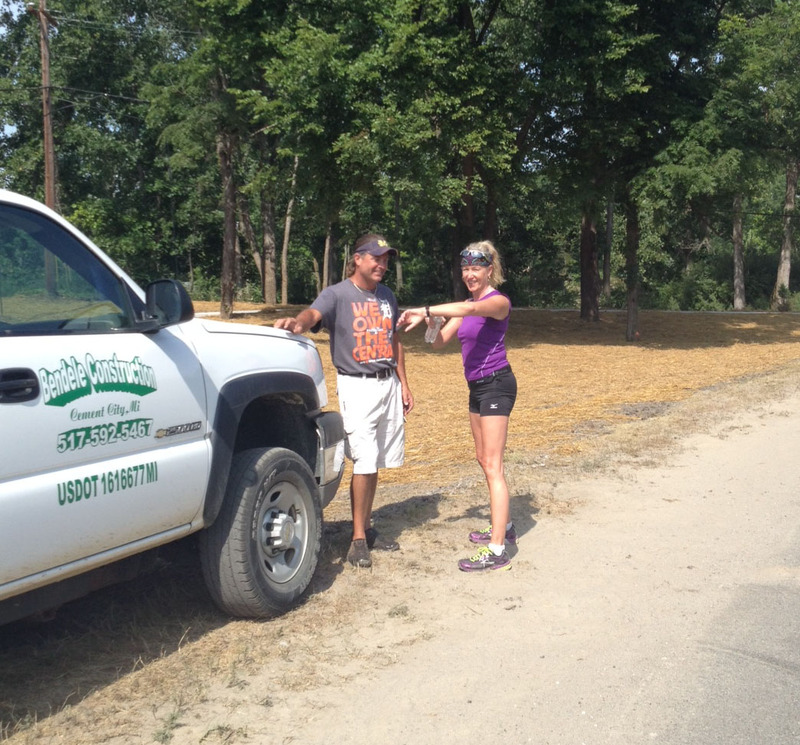 Dan Omo is helping to organize the crews who will spread out to locations around the lake. 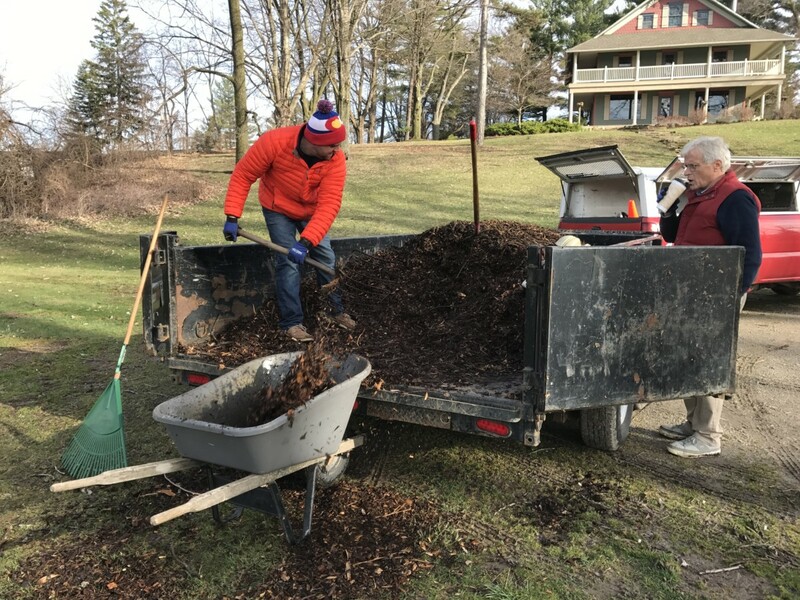 Those joining the effort should bring their favorite tools of the trade–rakes, gas powered blowers, brooms, garbage bags, etc. Rain date is Sunday, March 22 at 1 pm. The Clark Lake Spirit Trail is a shining example of what this community is about. The Trail was built with the idea of exemplifying community spirit. Funds for its construction and maintenance have come from voluntary donations and fund raisers, not tax dollars. And it’s been the many hours of hard work of the Trail Committee and the service-oriented volunteers that keep it in great shape. Because donations are so important to the Trail’s existence, it’s only fitting that names of donors be recognized. Users of the Trail know that there are names of donors embedded in the concrete in the portion of the Trail that parallels Jefferson Road. 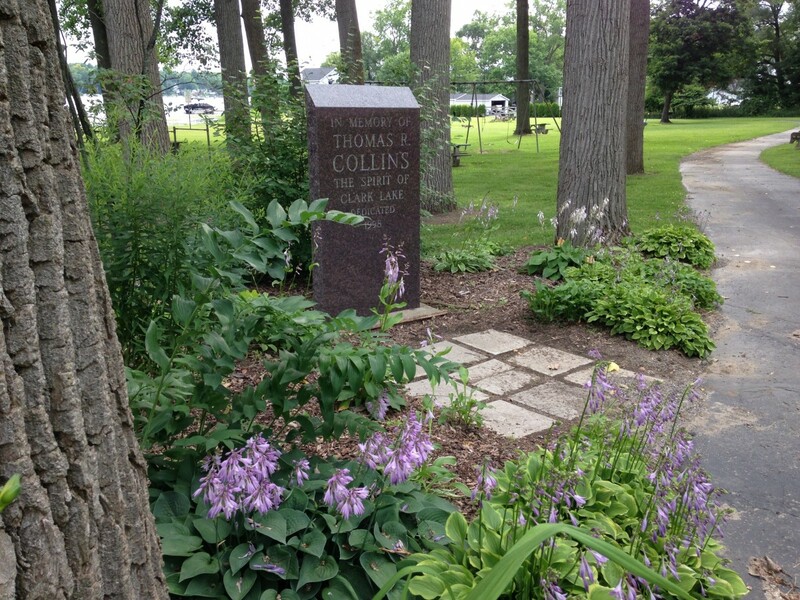 Additional donor names were recently engraved on a bronze plaque and attached to the granite marker at the trail head that lauds Tom Collins for his involvement in the Trail and community. Donations are always welcome and will be recognized. Michigan weather is a hard taskmaster, especially with the abuse it inflicts on any sort of pavement. That was painfully evident at the end of last winter when drivers had to play dodge ’em with rim-damaging potholes. The Spirit Trail also suffered in the area around the post office–from where the building starts, west to the old railroad bed. 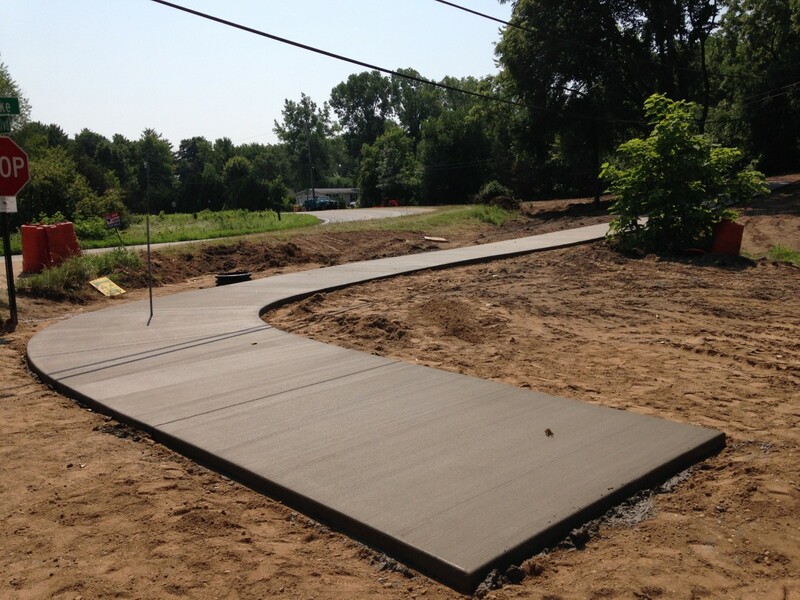 The Clark Lake Spirit Trail Committee has commissioned Bendele Construction to repave that section. Included will be a catch basin and drain to prevent the accumulation of water. The repeated freezing and thawing weakens the infrastructure and one fissure in the surface leads to another, destroying the integrity of the surface. The puddles are also a nuisance to those using the Trail. The construction plan recognizes that the surface must be robust enough to handle the weight of post office vehicles that have access to the small parking lot behind the building, used for loading and unloading deliveries. It’s expected that some prep work may be completed before the end of the year, depending on weather conditions. It’s likely that the laying of concrete will be delayed until spring. 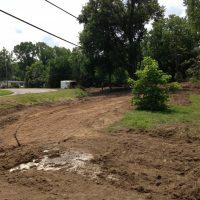 As with the Trail extension between Rita and Grand Boulevard at the east end, Ann Swain, Tucker Boyers and Vic Marshall are overseeing the project. Clark Lake Spirit Trail projects are funded through donations from people like you. Your donation is welcome and can be made through the Clark Lake Spirit Foundation, a non-profit for tax purposes. Simply use your credit card and go to “Donations” on this website–and direct the use of your donation to benefit the Clark Lake Spirit Trail. Early Saturday, July 27, the yellow barrier ribbons came down and the newly paved section of the Clark Lake Spirit Trail opened to all users. And the response was immediate as people tried it out for the first time. Ann Marlow was one of the first to explore the new extension. 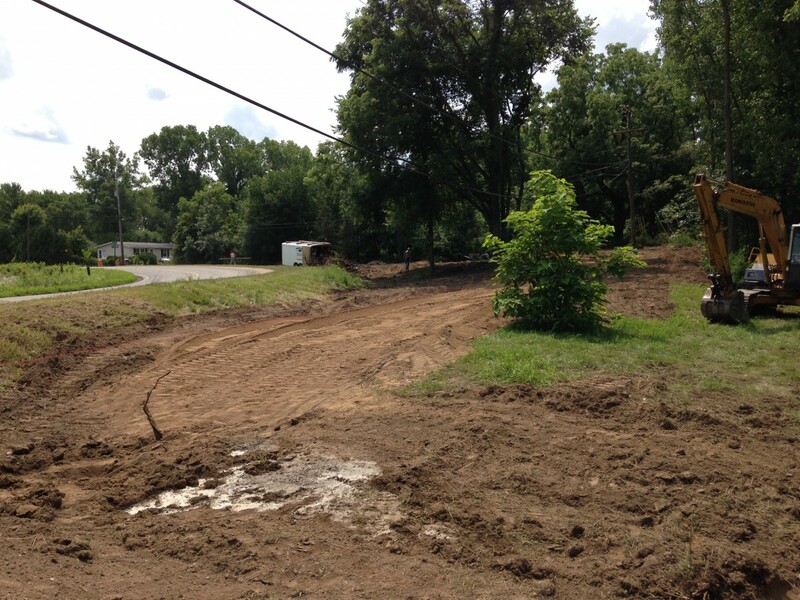 The new section follows the curve on North Lake Road, between Rita and Grand Blvd. Now it’s possible for cyclists, runners and walkers to keep more distance from traffic on a section of North Lake where the speed limit is 45 mph. The project is the work of the Clark Lake Spirit Trail committee headed by Ann Swain. Tucker Boyers led the project. Bendele Construction performed the work. 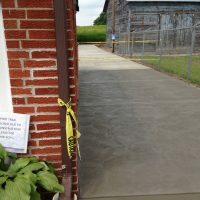 Bill Bendele said that the sealant was placed on the freshly poured concrete yesterday at midday. The overnight curing allowed for use of the new section by this morning. 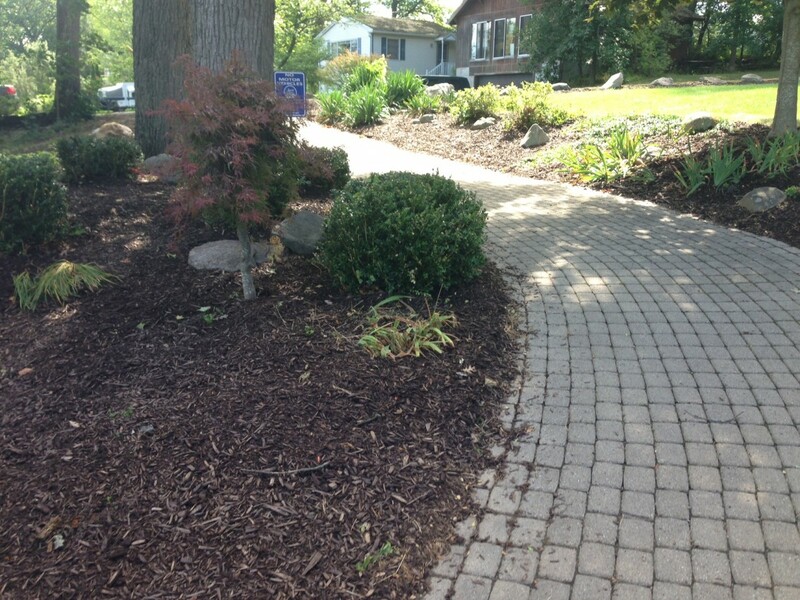 Bendele construction also was responsible for the landscaping. The area has been seeded and other interesting enhancements are in been place with eye appeal in mind. 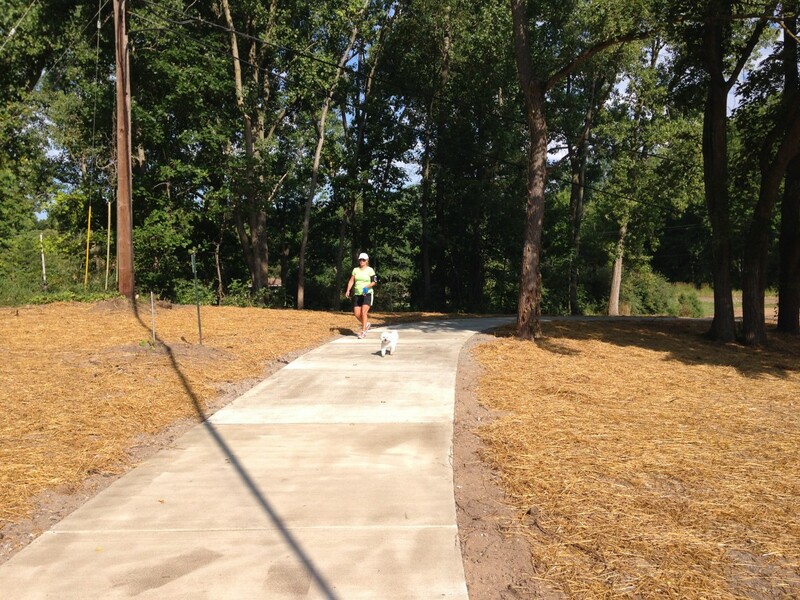 This new section of the trail now joins several other sections that are paved and are for the exclusive use of cyclists, runners and walkers. 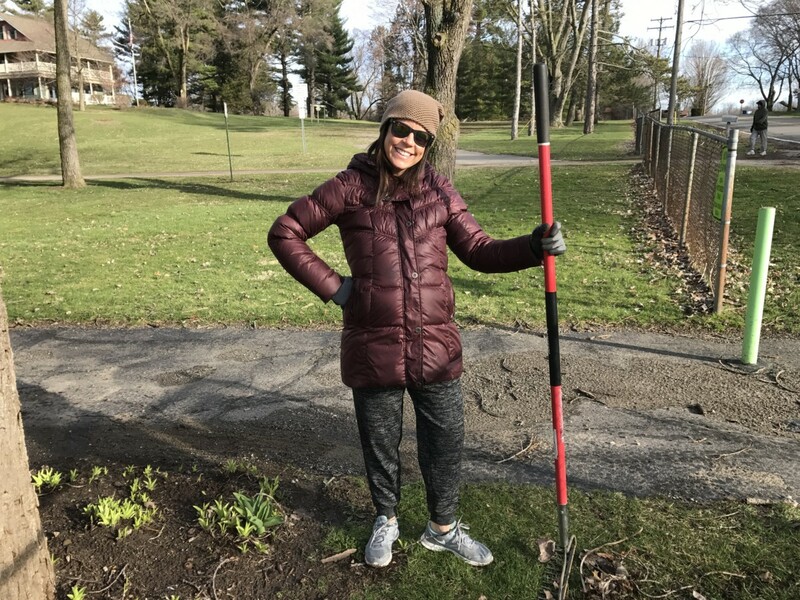 The other areas include–Jefferson Road, the Magic Forest between Jefferson Road and Lakeview East, through the County Park, the old Cincinnati Northern railway bed along Hyde Road, the cut-thrus’s between Oakwood and S. Woodlands and between S. Woodlands and Sandy Beach. The funding for this and other Trail building projects come solely through donations. The Trail committee maintains it mostly through volunteer efforts. And all of this reflects the spirit of those who originally conceived and developed the Trail–people like Tom Collins and George Svinicki. There have been many praises for the Clark Lake Spirit Trail over the years. 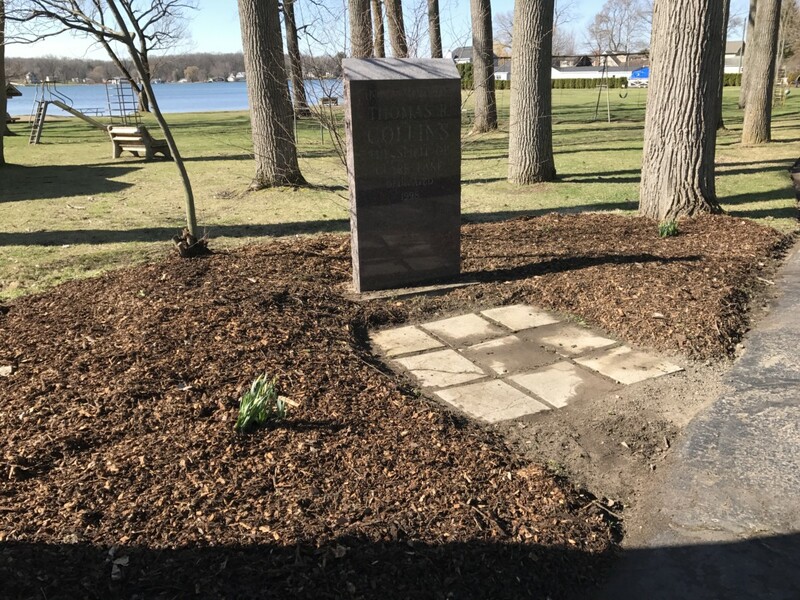 The Trail is a wonderful enhancement to the lake we love is and made possible through the hard work of the Clark Lake Spirit Trail Committee and the many donations from our community. What follows is a review of previous stories regarding the Spirit Trail. The entries pertain to events in 2013. No matter what the weather, summers are always beautiful at Clark Lake. And it’s awesome to see so many runners, bikers, and walkers enjoying the Spirit Trail! The forest in this section of the Spirit Trail creates the feeling of magic for runners, bikers and walkers. Over 900 runners participated in the 2013 Run Clark Lake event. Our volunteers heard many favorable comments about the run, our community spirit, and the beauty of our course around the lake. Without a staff of volunteers, the event would not be possible. To those who devoted their time and energy—thank you so much! An important, but fun, event that supports the Spirit Trail is coming soon—the Beer Fest. If you’ve attended in the past, just wait to see what’s in store this year! It will be bigger and better with more bands, and plenty of the best beer. Mark your calendar to be at the Beach Bar September 28th. You’ll find details at www.clarklakespirt.com, Facebook and a reminder on posters around the area. 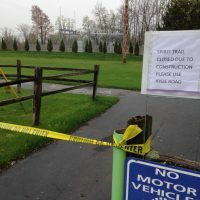 The Spirit Trail expansion plans continue to go forward. It’s expected that construction will be completed on a smaller section this fall. 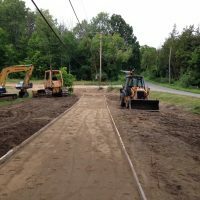 Environmental issues present a challenge in the other area, but the Trail will continue to pursue this project as it is designed to ensure safety of both users and motorists. 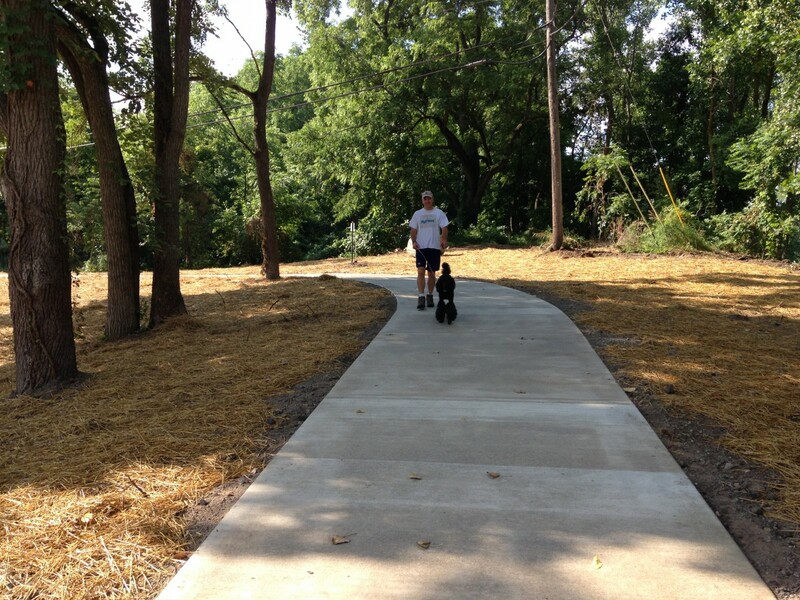 Thanks to the Calhoun’s, the path between Oakwood and South Woodlands looks better than ever. As you enjoy the Spirit Trail this fall, keep in mind one section is always closed during November and December for deer season. You’ll find barriers at the forested area between Jefferson Road and Lakeview (at the east end). For regular updates, please stop by our website often. The Trail is the result of the collaborative action of a community that cares deeply about expanding the horizons of this incredibly wonderful area. The funds freely donated by individuals and families, plus the huge amount of work on the part of many local residents, turned a dream into today’s reality. You can be part of the important project of expanding the Clark Lake Spirit Trail in the two new areas. Your donation to the Clark Lake Spirit Foundation in support of the Trail will make a difference. 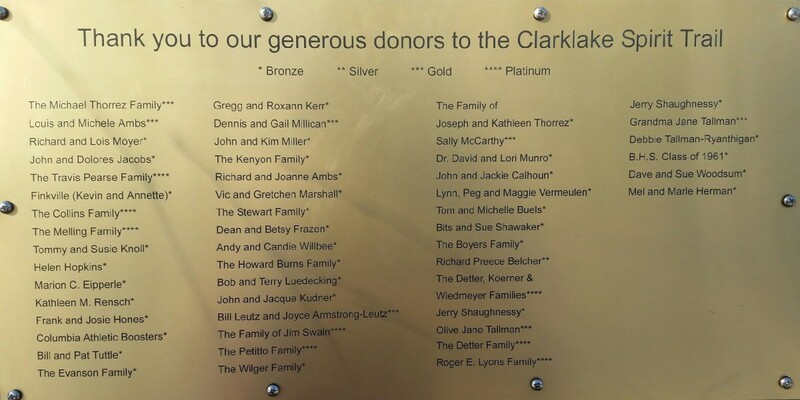 By donating to the Trail through the Clark Lake Foundation your contribution is tax-advantaged. For this tax-advantage, make out your check to The Clark Lake Spirit Foundation (and note that it is to benefit the Trail) and mail it to PO Box 224, Clarklake, MI 49234 or you can donate with your credit card through this website. If you have questions, Ann Swain (529-9485), treasurer, is available with more information and looks forward to hearing from you. 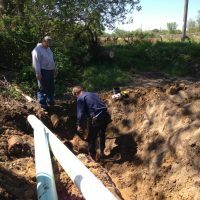 This is a big project, and your help is needed! Whether it’s a cash donation or you are among those who stop to pick up litter (or after their own dog), the community is grateful. By supporting the Clark Lake Spirit Trail, know that you will be part of enhancing the future, beauty and usefulness of this amazing place that we all love—Clark Lake! 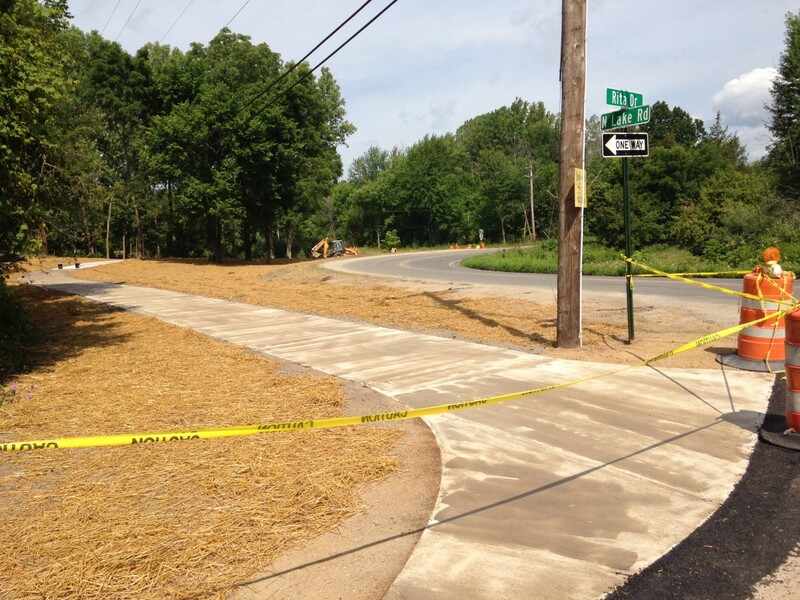 The section of the Trail that parallels Hyde Road has been resurfaced. You might think that the work for the Clark Lake Spirit Trail is finished. Actually it’s a work in progress. Most recently repairs were made to the section that parallels Hyde Road. 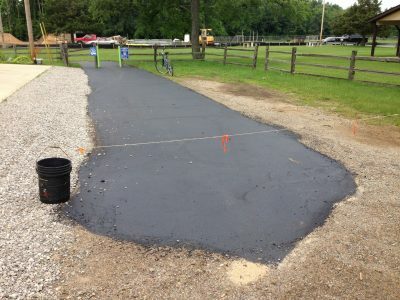 The trail has been patched and resurfaced. If you use this section of the trail, you’ll also notice the weeds have been cleared. If given a chance these weeds would soon overtake the paved area. Good to see them gone, at least for this season! 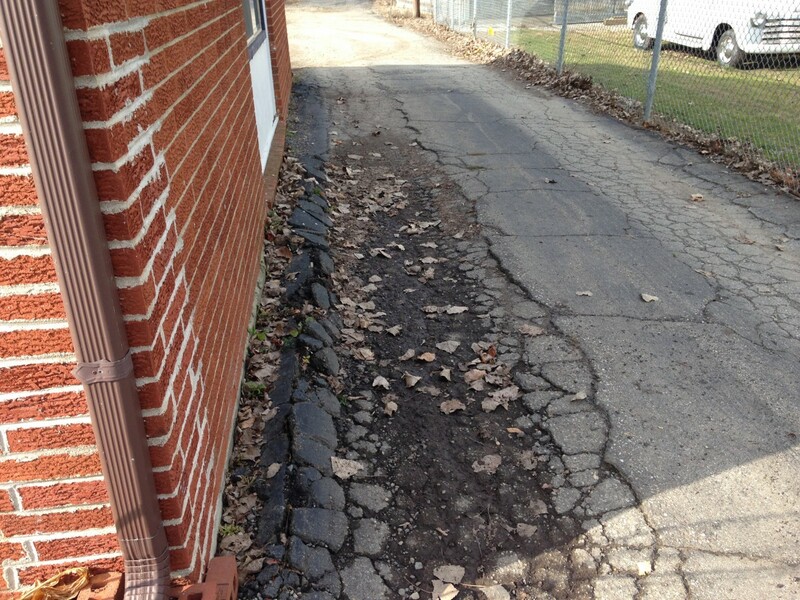 Earlier this year, other paved areas were cleared of debris and gravel. 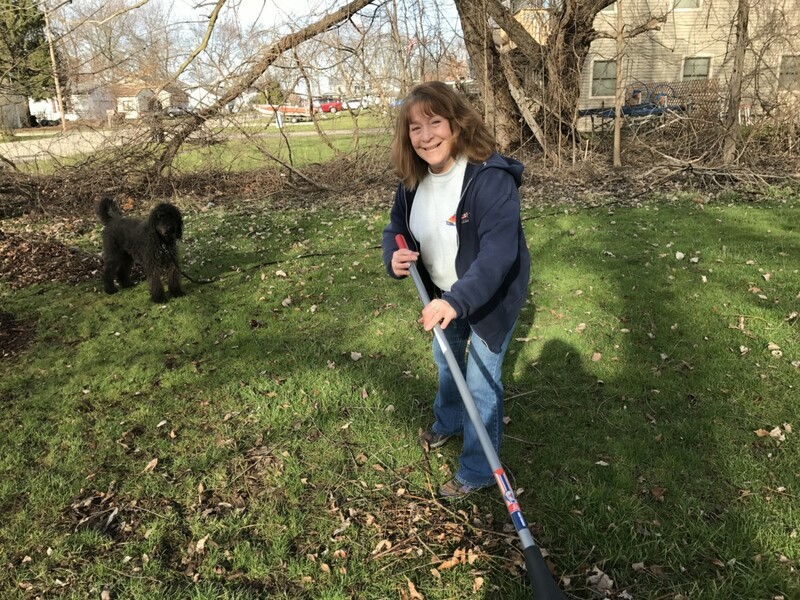 A team of volunteers cleaned up the section located in the County Park. This included scraping vegetation from the pavement revealing almost six inches more of pavement on both sides of the trail. The gardens were cleared of leaves and plants manicured. 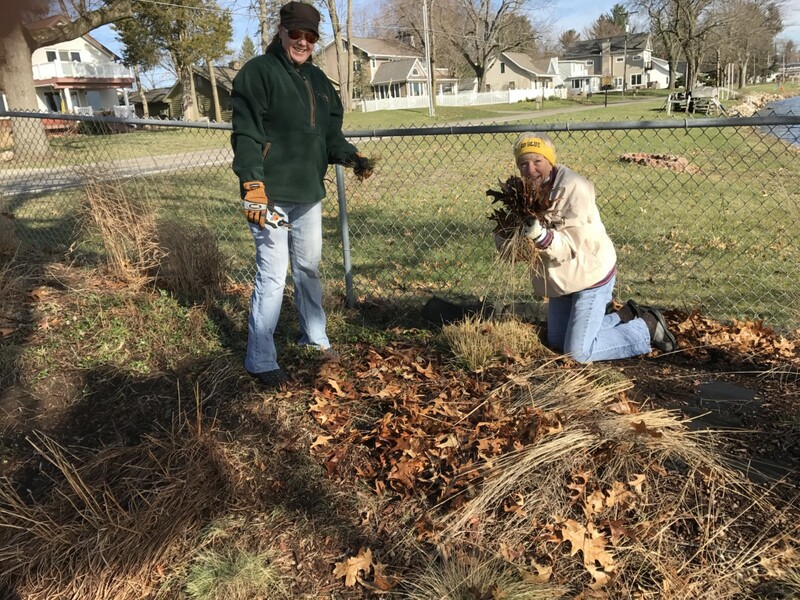 The trail committee has responsibility for maintaining the garden in the Township Park, and volunteers cleared leaves and other debris from this area. The Spirit Trail is looking great; perhaps it is at its best. And judging from activity the week of July 4th, the many bikers, runners and walkers are enjoying its ample attributes.